Silver-Knightstown; National Body Mfg. Co. The Knightstown Buggy Company was formed in 1900 (1898?) by Robert L. Silver and Charles Walters to manufacture carriages, wagons and hearses for their Indiana and Ohio neighbors. It was located on Third Street between South Washington and South Jefferson and specialized in custom automobile bodies, ambulances and funeral vehicles until the firm was reorganized in 1922. Silver and Walter split at that time, each partner forming their own rival firms, both of which had Knightstown in their names. Silver formed the Knightstown Body Company and marketed his products as Silver-Knightstown coaches starting in 1928. Walters formed the Knightstown Funeral Car Company, marketing his products as Knightstown Galahads. Both firms survived until WWII when the bulk of their employees went off to war and they were dissolved. Upon his return from WWII service, former Knightstown Body Company woodshop foreman, Vernon Z. Perry purchased the plant of his former firm's competitor, Knightstown Funeral Car Company and staffed it with co-workers from the Knightstown Body Company. To avoid any further confusion, Perry named the firm National Body Manufacturing Co. and would go on to produce hundreds of Chevrolet and Pontiac-based professional vehicles. The 1926 Knightstown catalog showed a stylish leather back landau funeral coach that included a wide attendant's door and unusually large tilted oval windows mounted alongside the landau bar on a Packard chassis. The unusual landau rear-window treatment continued into 1927 with the addition of a graceful curved rear-quarter window that replaced the earlier oval design. The long rear-quarter window followed the curve of the very long landau bar and looked just like the quarter windows found in a 1939/1940 Ford fastback sedan. Coaches could be built on any customer-supplied chassis although Knightstown favored medium-to high-priced chassis such as Cadillac, Packard, and Willys-Knight. Other Knightstown designs included regular limousine styles as well as a simple landau coach that included a large landau bar mated with a normal rear quarter window. Knightstown's side-loading coaches continued to use the traditional casket rollers imbedded in the compartment floor rather than the complicated the new Eureka 3-way table. 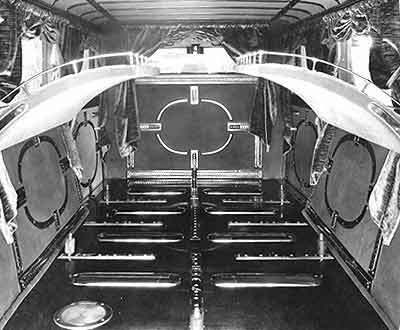 On Knightstown coaches, the driver and right front passenger seat-backs were removable and the bottom seat cushions tipped forward allowing the center-hinged partition between the driver and casket/patient compartment to move forward. With both the attendant's and driver's or RF passenger's door open wide, the casket or casualty could be loaded with relative ease. Knightstown advertised that their rattle-free side-loading system had no tables to pull out, jam or break. Starting in 1928 the Knightstown Body Company's coaches, previously known as Knightstown Coaches, were marketed under a new "Silver-Knightstown" trade name. "Silver" referred to longtime company director Robert L. Silver. Silver-Knightstowns were built only on the finest chassis such as Cadillac and Lincoln. These expensive coaches included padded-leather tops, luxurious interiors and beautiful stained and leaded glass rear quarter windows. Regular 1928 Knightstowns used the same basic body placed on medium-priced chassis specified by the customer such as Packard and Buick. During these years Knightstown coaches were easily identified by their distinctive belt-line moldings and wide nickel-plated plaques that identified the funeral home, hospital or ambulance service. 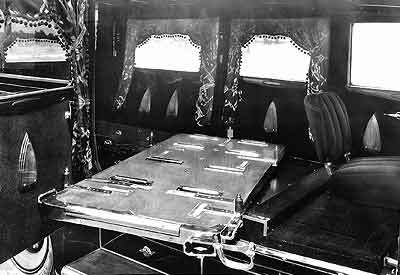 1929 Silver-Knightstown side-loading funeral coaches featured Robert L. Silver's (Knightstown's founder & president) new patented self-guiding 3-way casket table. Similar to Heise's and Eureka's 3-way tables it differed enough to garner Silver a third 3-way table patent in 1928. Silver-Knightstowns featured padded-leather tops, luxurious interiors, and leaded glass rear quarter windows. Knightstown also built quite a few hearses (at least 10) on Rolls-Royce chassis in the 1920s and 30s. Some where on used chassis but most were on new chassis - see the coachbuilders tables in deCampi's Rolls-Royce in America for more details. They also built an attractive coupe on one of the Roll-Royce chassis and are know to have built a few other passenger cars bodies during the classic-era. 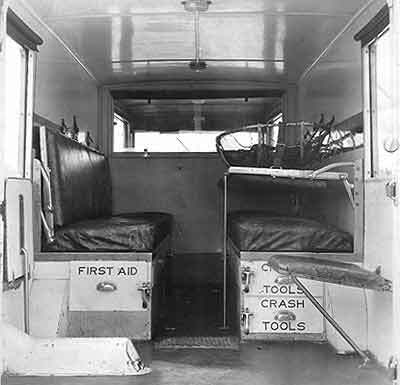 Invalid coaches (ambulances) included a forward-facing centrally-mounted red warning light, dual spotlights attached to the tops of the A pillars, a bumper-mounted siren and smaller auxiliary spot-lights mounted on top of dual Gordon spare tire covers. Chassis used during the late Twenties included Buick, Cadillac, Lincoln and Packard. Between 1928 and 1932 Silver-Knightstown built a few beautiful town car invalid coaches that included a convertible driver's position in addition to the regular ambulance equipment, one example was known to have been built on a 1932 Cadillac V16 chassis. In the early Thirties, Cadillac was Silver-Knightstown's chassis of choice and constantly appeared in their advertisements mated to stunning white town cars featuring contrasting royal blue trim. 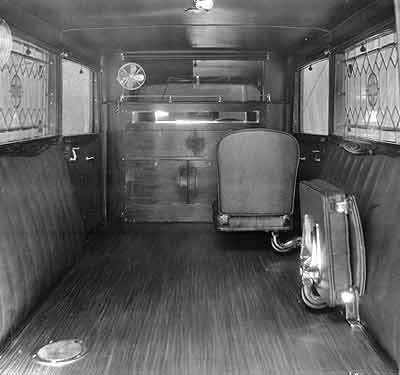 One popular Silver-Knightstown product in the late 30's was a large "parlor car" built from one of the firm's high headroom ambulance bodies, and outfitted as a chauffeur driven parlor car. There was a market for such a car in the Northeastern regions where commuting into the city via train from the suburbs was common, and by that time, Silver-Knightstown had been building special high headroom ambulances which were popular in the New Jersey area with rescue squads. One memorable 1939 Silver-Knightstown coach was a striking black ambulance mounted on a stretched Lincoln K chassis that included a large grill-mounted manual fire bell. Another Silver-Knightstown ambulance appeared in 1941 on a new Cadillac chassis. It had an unusual high roofline with built in emergency lights and an unusual vented rear quarter-windows. Quite unfairly, LaSalle had acquired the reputation of being a "cheap" Cadillac and was eliminated by GM just as Cadillac released their new Bill Mitchell-designed models in 1941. The new Cadillac was decidedly forward-looking, side-mounted spares had been eliminated and the new Hydra-Matic automatic transmission was available for the first time having been pioneered by Oldsmobile in the previous year. The prow-nosed look seen in the Thirties was gone, replaced by massive front-end highlighted by the now-famous eggcrate grille. Headlamps were now mounted in, rather than on top of, the front fenders. Equipped with a Cord-like coffin-nose hood the new Cadillacs were noticeably different from their predecessors and set the standard for American luxury during the 1940s. Knightstown built a number of Cadillac-chassised funeral coaches and ambulances prior to the War. Municipal ambulances were their bread & butter and Knightstown built quite few of them equipped with high roofs and built-in emergency lighting. 1942 flower cars featured a 5-window business coupe roof mounted on top of a standard Knightstown coach body that had been built without a roof. The coupe's blanked-in rear quarter-windows were filled-in and the base of the roof flowed straight back to the rear of the flower box which had a makeshift faux folded-convertible roof. The rear doors were left intact and could be used to load chairs or other graveside necessities. Access to the casket compartment was through the tailgate which had built-in casket rollers that matched those on the compartment floor. The height of the exposed stainless steel flower deck was adjustable so that different-sized floral tributes could be accommodated and a tonneau was included to cover the bed when not in use. According to Robert Silver's son, Silver-Knightstown closed down at the start of WWII due to the limited possibilities of obtaining qualified labor and the now-rationed materials needed to maintain production, even though it was still operating profitably at the time. When the plant was finally shut down in 1943, Silver took a job with Hess & Eisenhardt Company as their eastern states sales representative. See National Body Company for Knightstown Body's post-war history. See Knightstown Funeral Car Company (Knightstown-Gallahad) for its history. © 2004 Mark Theobald - Coachbuilt.com, with special thanks to Bernie DeWinter IV.